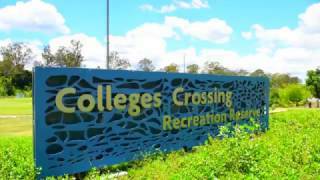 A wonderful way to cool down and enjoy the great outdoors in Ipswich is at Colleges Crossing Recreation Reserve. The crossing is a low-lying bridge that crosses the Brisbane River in the suburb of Chuwar, and this long-time favourite with locals and visitors has all you need for a relaxing day out for all ages. Although Colleges Crossing has been severely damaged by floods in recent years, each time it's bounced back bigger and better, meaning that many of the facilities are fairly new. This includes a nature-based children's playground covered by shade sails with equipment such as a fort, musical wall, spinning seats, tree log tunnel and frog sculptures. There's a lake for fishing and kayaking, and while it's advised not to take the full plunge for a swim, you can enjoy paddling in the shallows and skimming stones. The large, grassed area has plenty of room for sports and there are also bike/scooter paths and walking tracks. After all that exertion, sit back and enjoy the treats served at the café with beautiful views of the river, or bring your own picnic or barbecue to enjoy at the sheltered tables.